WASHINGTON — Defense Secretary Jim Mattis and Secretary of State Mike Pompeo on Wednesday defended the U.S. relationship with Saudi Arabia at an all-Senate briefing on the war in Yemen and the murder of journalist Jamal Khashoggi. The two top Cabinet officials appeared at a closed-door meeting ahead of a Senate vote Wednesday afternoon on a resolution to rein in U.S. military support for the kingdom. The resolution was brought by Sens. Bernie Sanders, I-Vt.; Mike Lee, R-Utah; and Chris Murphy, D-Conn.
A procedural vote ahead of debate next week passed the senate, 63 to 37, and Sanders told reporters the matter is expected to come up next week. The White House issued a veto threat before the procedural vote arguing the resolution is flawed because U.S. forces are not directly engaged in hostilities between the Saudi-led coalition and Houthi forces in Yemen. Proponents argue that American targeting and refueling support (which the administration recently ceased) are hostilities. Mattis, in prepared remarks released by the Pentagon, said told senators that morning that cutting off U.S. military support would undercut diplomatic efforts to end Yemen’s civil war. It’s necessary to demand accountability for Khashoggi’s murder “while recognizing the reality of Saudi Arabia as a necessary strategic partner,” he said. “I must note we are seldom free to work with unblemished partners. Long-standing relationships guide but do not blind us,” Mattis said. “Saudi Arabia, due to geography and the Iranian threat, is fundamental to maintaining regional and Israeli security, and to our interest in Mid-East stability." Mattis and Pompeo both said the U.S. is on the verge of starting peace talks. While Mattis was sober, Pompeo struck an antagonistic tone in an op-ed published by the Wall Street Journal on the morning of the briefing. He accused lawmakers of “caterwauling” and the media of a “pile-on” over Khashoggi’s murder. “The Trump administration’s effort to rebuild the U.S.-Saudi Arabia partnership isn’t popular in the salons of Washington, where politicians of both parties have long used the kingdom’s human-rights record to call for the alliance’s downgrading,” Pompeo wrote. New controversy threatens to roil the rocky U.S.-Saudi relationship and casts a cloud over US-Saudi defense deals. While the goal was to shore up support for the war in Yemen, some lawmakers were repelled that the White House blocked CIA Director Gina Haspel from attending. Lead senators wanted her to provide her direct assessment of Khashoggi’s killing and whether Saudi Crown Prince Mohammed bin Salman was responsible. 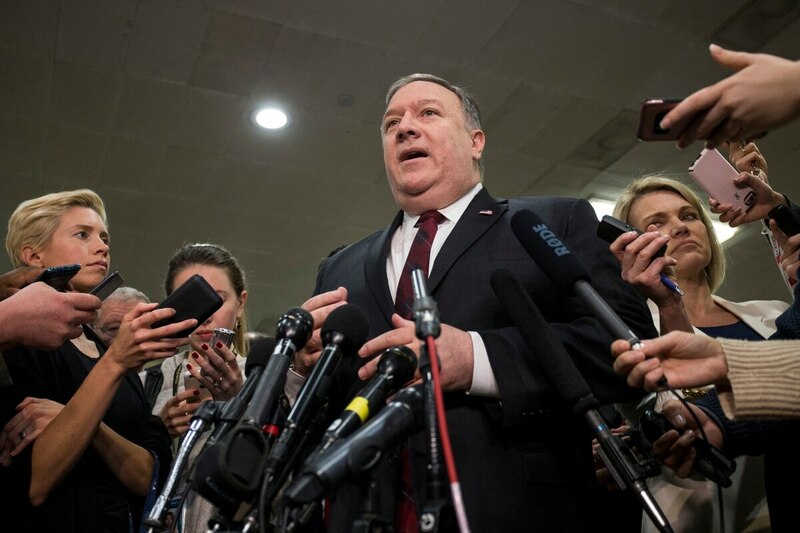 Pompeo told reporters after the briefing that there was “no direct” evidence linking the crown prince to the murder, but many senators remained unconvinced and frustrated. Senate Foreign Relations Committee Chairman Bob Corker, R-Tenn., was among senators who requested Haspel appear. He has in the past defended the U.S.-Saudi relationship in crucial votes, but upon leaving the briefing, he told reporters he would vote to advance the Sanders-Lee-Murphy resolution for the purposes of starting a debate. Corker said the resolution was the only means available to address an imbalance in the Trump administration’s and Riyadh’s handling of Khashoggi’s murder, if not the relationship overall. He noted that the measure may yet be amended to find some middle ground. Senate Foreign Relations Committee ranking member Bob Menendez, D-N.J., accused the administration of a “coverup” in Khashoggi’s murder because Haspel was not made available. He voted in March to table the Sanders-Lee-Murphy resolution, but civilian casualties in Yemen have changed his mind.